UPDATED: Wed., Feb. 14, 2018, 8:07 p.m.
A dog died and three people were injured in a house fire Tuesday night in Hillyard. 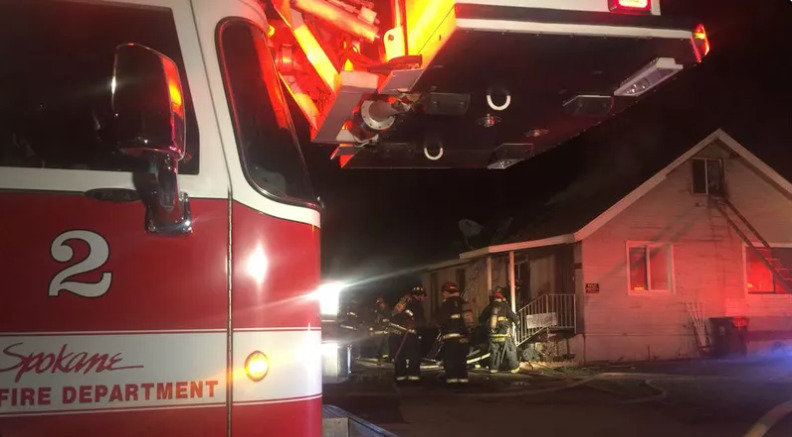 Crews with the Spokane Fire Department responded to 1611 E. Ostrander Ave. at about 9:30 p.m., where a one-and-a-half-story home was heavily engulfed in smoke, city officials said in a news release. Three people were apparently in the home at the time of the fire. Two of its six residents were able to evacuate safely, but one tenant had to jump through a first floor window to escape due to heavy smoke conditions. The fire was brought under control within 30 minutes, officials said. A dog died inside the structure. Property records indicate the home is owned by residents of Great Falls, Montana. The residents were treated and released with minor injuries. One firefighter was injured when he stepped on a nail, but did not receive treatment at the scene, the release says. The American Red Cross was able to assist the six people with shelter. Published: Feb. 14, 2018, 2:46 p.m. Updated: Feb. 14, 2018, 8:07 p.m.